At age 13, Henry Haight enrolled in the Rochester Collegiate Institute. He graduated from Yale University with high honors in 1844. After graduating, he went to work for his father, Fletcher Haight, who was an attorney in St. Louis, Missouri. In 1847, Haight was admitted to the Missouri bar and went into partnership with his father. Haight was among the early pioneers who traveled to California after the discovery of gold. He arrived in San Francisco in 1850 where he set up a law firm that became well regarded throughout the state. Haight became active in politics in 1853 when he ran as a candidate for the State Legislature, which he lost to former Governor John Bigler. In 1859, Haight served as the chairman of the Republican State Committee at the Republican State Convention. He strongly supported the Republican Party; however, by the early 1860s, Haight switched party allegiances. 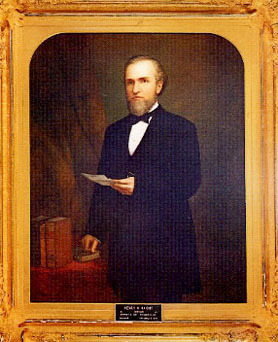 In 1867, Haight was elected Governor of California on the Democratic ticket. The state debt was reduced under Haight's administration. He also stopped paying government subsidies to silk and woolen manufacturers, payments that had happened throughout the state for many years. He is credited with establishing the State Board of Health and the University of California, which had only been in the planning stages until his term of office. After leaving the office of Governor, Haight returned to practicing law. In June 1878, Haight was elected as a delegate to the Second Constitutional Convention. Before the convention could convene Haight collapsed and died around noon on September 2, 1878 at his doctor’s bathhouse. Use the California State Library’s interactive tool to view Executive Orders and Proclamations signed by Governor Haight.